Indicates the direction of Kaaba (Qibla) using Google Maps. 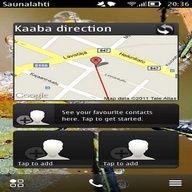 Includes Homescreen widget for Symbian Belle. Application downloads maps from internet. Data rates apply!